If you already use jQuery for writing web applications, that’s fine: Hopefully we will discuss some topics to make you more comfortable and more proficient with it. If you do not, but you write web applications, then why don’t you? Why Do I Care Again? jQuery shields you from many of these subtle differences. In fact, most of the time, you can probably forget about browser differences and the differences between versions of a browser. It is in your best interest to stay with the current version because they are also staying on top of the browser differences and version differences so that we don’t have to. Such notifications are a nice way to let the user know that an update or save was successful. If you use this strategy to display an error message, make sure that you leave the toast up long enough to allow the user to note the error and take appropriate action. If you are not familiar with jQuery, it may not be obvious what is going on here. Let’s step through the code. The first line gets a reference to the jQuery object for a div tag with the id of “toast”. The second line hides the div tag. The next line adds our message to the contents of the div tag. This functionality could be implemented like this without jQuery. The fadeout would do the same thing just in reverse. The delay would be implemented with a timeout function call. Hopefully, this showcases how much easier jQuery can make things. To use this function, simply add a div tag, styled properly, to your page with an ID of toast and you are good to go. I will often add this to the bottom of my master page or _Layout. If you style it to stand out slightly and force it to be at the bottom of the page, then you will have a quick and easy way to give notification back to the user. You can also add variations to show different types of notifications, potentially changing how long it will be visible and how it will be styled. The showToastError method is used to show an error condition. We want it to be up for a whole minute or until the user explicitly closes it and by adding the CSS class “error” we make it more obvious that this is an error condition. The error class may change the background color or image, it may make the div tag larger or take other steps to make it more indicative of an error condition. I get the following effect by simply adding the following style sheet class. This will find all fieldsets in a page and the stylesheet class panel to them. Or, you may want to select a specific text box to get the value from it. The val() method is handy to get the value from most input types (most notably this does not work on checkboxes, but it does work nicely for everything else. Or, you might want to access all elements with a specific class in order to format the text in it. In this case, we may want to use a plugin that will format a string as currency. Naturally, the selectors can get much more complicated, but these are the basics that you will use most frequently. Selecting based on id is usually the most efficient. Another common optimization is to store the result of the match and use it later as opposed to repeatedly invoking the selector. This is a form of caching; you are caching the parsing results. There is potentially a substantial run time difference between a badly written and well written selector. Caching the results of running a selector and ensuring that it has to run only once is a great way to minimize the performance implications if a selector is not well written. In both cases, the selector grabs all of the checkboxes. The each method will run the anonymous function against each match. Here we explicitly set the checked attribute for the checkbox. For this simple example, we don’t really care about the parameters to this anonymous function, but each time it is called, we do get two parameters, index and element. The index tells us which item in the list of matches we are working on while element will be the instance of the matched item. Index will be an integer and element would be the individual checkboxes. With a little bit of creativity, you can find all kinds of uses for this .each method. We will see a nice application later in this article. From a usability perspective, it is good to be able to style input controls differently when they receive, or lose, focus. This is relatively straightforward with a little bit of jQuery. The ready event will be fired once the DOM is ready. Here we define an anonymous method to be run when that event is fired. Using the ready event handler is common in jQuery to ensure that all of the DOM is ready. In this case we will grab a reference to every input control and add an event handler for the focusin and focusout events. In these respective event handlers, we simply add and remove a class to the input tag. How an item looks when it has focus depends on how the .focus class is styled. Depending on the look you are going for, you may want to change the background color, change the border color, or add a drop shadow. For instance, you may want to add a couple of drop shadows and explicitly change the background color to make it really stand out. With this one snippet of code and a single style sheet class, you can easily add impressive focus tracking to your application. You can also use the same technique to create real time validation tracking. Let the event handler for focusout perform the validations, or compare the data on focusin and focusout to determine what the user changes. You may often find that your web page has more content that the user can readily deal with. When this happens, it can be handy to be able to collapse regions to hide content that is not readily relevant. I often follow the strategy of using fieldsets and using the legend’s click event as a trigger to toggle visibility. You’ll probably have noticed that we are not actually toggling visibility. We are instead grabbing the contents of the fieldset excluding the legend. If there is content, we store it in the legend’s data store and then remove it as content. If there is already no content, we retrieve it from the data and append it back to the parent. So we aren’t technically toggling visibility. We add and remove the contents as needed. This allows us to easily show and hide the contents of the fieldset regardless of what it contains and still preserve the legend as the source of the trigger. This technique will work for tag combinations beside the fieldset and legend. As long as the trigger is the first child of the parent, you are good to go. If the trigger is not the first child, it will be after the contents are expanded for the first time. One of the most challenging problems with usability is date entry. Dates are tough to validate. They are annoying to enter and there is not a one-size-fits-all approach that works across the board. That being said, http://jqueryui.com/ includes a very nice DatePicker widget that can easily be added to a web application to give a “one size fits most” date entry field. jQueryUI is a jQuery plugin that provides several useful widgets that all work together, have a similar API and can easily be themed together. Here we are telling the datepicker to show when the user clicks a button, open to the currently selected date, using an animation called “fold” to make itself visible, we specify where to get the button image, and finally we tell it to show the image only and not put it on a button. If you are planning more than one datepicker on the page, then you could make this more generic and just give them the same class name (‘DateEditor’ in this case). This will find every element with a class of dateEditor and apply the datePicker. With this in place, you only need to add the datePicker class to the input control and let jQuery take care of the rest. In your markup, you only have to add the class and make it readonly. 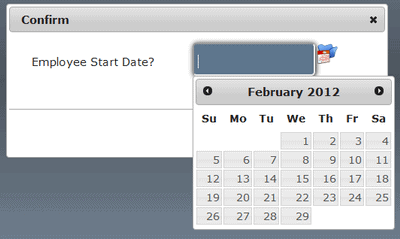 <input type = "text" id = "startDate"
With these two pieces in place, any date field can be converted to a date picker. jQuery UI is a wonderful addition to any web application. We will explore its uses more fully in a future article. Our bindDataToTable method accepts two parameters. The first one is an array of JSON objects. The second one is the jQuery reference to the table that we will bind to. The markup variable will contain all of the table rows that will go into the table. We start by building out the table headers. We loop through the names of the properties in the first object. For each property, we split the name at the capital letters to make nicer headers. Note that we don’t actually “split”, instead we are using a regular expression to match the capital letters and replace them with a leading space and then whatever letter triggered the match. After we have the header row mapped out, we are ready to add the rows for the data. The outer each loop loops through the items in the array. The inner each loop loops through the properties for that object. The calls to the “hasOwnProperty” method ensure that we are only binding properties defined at this level of inheritance. If you want to include properties defined in a base class, simply remove these conditionals. Typically there will not be any inheritance when dealing with JSON objects, but this simple method can be used for more than just JSON data. 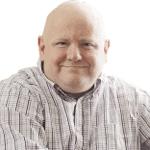 This simple approach can be extended to accommodate a wide range of data binding needs. jQuery is wildly popular and for good reason. Its uses for adding animation and engaging style elements are well publicized, this should give a sampling of how such magic works. You should have a better feel for some of the ways you can use it to make your web applications faster and more interactive. We will build on some of these techniques over future articles. Practice these simple recipes. Build on them. You will find that they form the basis for some very tasty treats you can add to any application. We will build on the concepts in future articles. I love the idea of the bindDataToTable. I definitely plan to use this. Makes me want to revisit some recent projects and laugh at all the places where I could have used this little trick. The explanation given with the CheckAll function was the best explanation I have seen for the .each method. Maybe I am a little dense but I have always missed it until now. Yes. You are correct. The checkAll and unCheckAll could and probably should be combined into a single function. My intention was to keep the sample functions more specific, hopefully this did not cause extra confusion for anyone. If you want to reuse this function on any arbitrary form, you should pass in the explicit selector. However, this function is so trivial that I would question whether or not it is worth it for the extra complications required to make a one size fits all method for any page. Sometimes the benefits in trying to make a more generic solution do not justify the extra complexities introduced. I will get a sample html and css file ready to upload. Please check back soon.